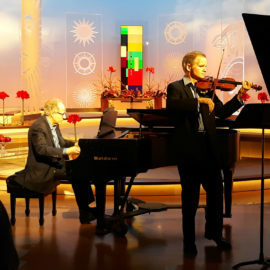 Music from Copland House Principal Violinist Curtis Macomber and Founding Pianist Michael Boriskin appeared on CBS Sunday Morning, as part of the nationally-telecast program’s regular Almanac feature. Hosted by Jane Pauley, the segment marked Copland’s passing in 1990, and included a brief profile of Copland’s career, referenced Copland House, and an live, in-studio performance of an excerpt from Copland’s own violin-piano arrangement of Hoe-Down from Rodeo. Twelve highly-gifted American composers from eight states have been chosen for the 2018 Copland House Residency Awards, all-expenses-paid stays at Aaron Copland’s National Historic Landmark home in New York’s Lower Hudson Valley. This year’s winners are Michael Brown, 31 (New York, NY); Ke-Chia Chen, 38 (Philadelphia, PA); Andrea Clearfield, 57 (Philadelphia, PA); Michael Fiday, 57 (Cincinnati, OH); Michael Gilbertson, 31 (San Francisco, CA); Huck Hodge, 41 (Seattle, WA); Benjamin Krause, 33 (Valparaiso, IN); Remy Le Boeuf, 32 (Brooklyn, NY); Zibuokle Martinaityte, 45 (New York, NY); Paula Matthusen, 39 (Middletown, CT); Justin Merritt, 43 (Northfield, MN); and Greg Reitan, 45 (South Pasadena, CA). Secret Alchemy, Music from Copland House’s newest CD featuring the work of two-time Resident PIERRE JALBERT, “an acknowledged chamber-music master” (The New Yorker), is to being released on January 24. Nine gifted American composers from nine states have been chosen for the 2016 Copland House Residency Awards, all-expenses-paid stays at Aaron Copland’s National Historic Landmark home in New York’s Lower Hudson Valley. This year’s winners are Nilo Alcala, 38 (North Hollywood, CA); Daniel Gilliam, 37 (Louisville, KY); Christopher Hopkins, 59 (Ames, IA); Howard Kenty 36 (Brooklyn, NY); Mark Kilstofte, 57 (Greenville, SC); Texu Kim, 35 (Hillsboro, OR); Peter Van Zandt Lane, 31 (Athens, GA); Eric Nathan, 32 (Providence, RI); and Juri Seo, 34 (Lawrenceville, NJ). Copland House announces the six Fellows chosen to participate this June in CULTIVATE, its acclaimed, annual emerging composers institute. The composers selected are Jenny Beck (29, Philadelphia, PA), Ryan Chase (28, Cohoes, NY), Carolyn Chen (32, Pasadena, CA), Patrick Harlin (31, Ann Arbor, MI), and Michael Small (27, Washington, DC), as well as Daniel Schlosberg (28, Brooklyn, NY), who was selected as part of Copland House’s collaboration with the Nashville Symphony’s new ComposerLab. The six Fellows were chosen out of nearly of 93 applicants from 26 states and 3 countries by an eminent jury of acclaimed composers – CULTIVATE Director Derek Bermel, Donnacha Dennehy, and Reiko Fueting. Read the enitre release HERE. CULTIVATE 2016 is an annual, intensive creative workshop and mentoring program for American composers in the initial stages of their professional careers. Six Fellowships are awarded to American citizens or permanent residents to participate in this week-long emerging composers institute, which takes place June 6-12, 2016 at Aaron Copland’s National Historic Landmark home and its satellite venue at the historic Merestead estate, near New York City. Fellows each compose one 5 to 7 minute, small-ensemble composition (any combination of flute, clarinet, violin, cello, and/or piano), which serves as the core of their work at the institute. CULTIVATE consists of daily individual and collective rehearsals and work sessions exploring and refining the new pieces with composer-clarinetist and program director Derek Bermel and the Music from Copland House ensemble; informal discussion sessions with prominent music executives and arts leaders about practical, professional, and career matters; and a final public concert and live recording premiering all the Fellows’ new compositions written for CULTIVATE. All expenses (round-trip transportation within the continental U.S., session participation, accommodations, food) are covered. Thanks to the generosity of special Westchester Community Foundation Fellowships, CULTIVATE encourages applications from gifted young composers born, raised, studying, living, and/or working in Westchester County, NY, who have completed their undergraduate studies and are now beginning to embark on their professional careers. Composers must submit a CULTIVATE application form (downloadable), three representative works and recordings, and 1 to 2 page resume. Ten gifted American composers from eight states have been chosen for the 2015 Copland House Residency Awards, all-expenses-paid stays at Aaron Copland’s National Historic Landmark home in New York’s Lower Hudson Valley. The winners are Carlos Carrillo (45, Urbana, IL), Viet Cuong (24, Princeton, NJ), William Dougherty (27, New York, NY), Melody Eotvos (30, Bloomington, IN), Jeremy Gill (40, Jamaica Plain, MA), Charles Halka (32, Houston, TX), Gabriella Smith (23, El Cerrito, CA), Christopher Stark (34, St. Louis, MO), Christopher Trapani (35, Astoria, NY), and Roger Zare (29, Evanston, IL). This brings to nearly 140 the total number of residencies hosted by Copland House since its flagship composers’ program was launched in 1998. Copland House has announced the Fellows for its CULTIVATE 2015 emerging composers’ institute. For full press release, click HERE. For a CULTIVATE video click HERE. CULTIVATE 2015 is an annual, intensive creative workshop and mentoring program for American composers in the initial stages of their professional careers. Six Fellowships are awarded to American citizens or permanent residents to participate in this week-long emerging composers institute, which takes place June 1-7, 2015 at Aaron Copland’s National Historic Landmark home and its satellite venue at the historic Merestead estate, near New York City. Fellows each compose one 5 to 7 minute, small-ensemble composition (any combination of flute, clarinet, violin, cello, and/or piano), which serves as the core of their work at the institute. CULTIVATE consists of daily individual and collective rehearsals and work sessions exploring and refining the new pieces with composer-clarinetist and program director Derek Bermel and the Music from Copland House ensemble; informal discussion sessions with prominent music executives and arts leaders about practical, professional, and career matters; and a final public concert and live recording premiering all the Fellows’ new compositions written for CULTIVATE. All expenses (round-trip transportation within the continental U.S., session participation, accommodations, food) are covered. Beloved chef Lidia Bastianich and 2006 CH Resident Daniel Brewbaker team up on Sunday, October 12 at 5pm for “The Awakened Palate,” this year’s culinary and musical gala. Read the press release HERE. Click HERE to find out the latest news from Copland House. Let us know what you think! Copland House is 1 of only 2 lower Hudson Valley arts organizations to receive an NEA grant in the current funding round. The $10,000 grant will support concerts and radio broadcasts of American music performed by Music from Copland House, as well as related educational activities in Westchester schools and on-site at Copland’s home. Copland House announces CULTIVATE 2014, an annual, intensive creative workshop and mentoring program for American composers in the initial stages of their professional careers. Six Fellowships are awarded to American citizens or permanent residents to participate in this weeklong emerging composers institute, which takes place June 16-22, 2014 at Aaron Copland’s National Historic Landmark home and its satellite venue at the historic Merestead estate, near New York City. Fellows each compose one 5- to 7-minute, small-ensemble composition (any combination of flute, clarinet, violin, cello, and/or piano), which serves as the core of their work at the institute. CULTIVATE consists of daily individual and collective sessions exploring and refining the new works with composer-clarinetist and program director Derek Bermel and the Music from Copland House ensemble; informal discussion sessions with prominent music executives and arts leaders about practical, professional, and career matters; and a final public concert and live recording premiering all the Fellows’ new compositions written for CULTIVATE. All expenses (round-trip transportation within the continental U.S., session participation, accommodations, food) are covered. FOR YOUNG WESTCHESTER COMPOSERS: Thanks to the generosity of a special Westchester Community Foundation Fellowship, CULTIVATE encourages applications from gifted young composers born, raised, studying, living, and/or working in Westchester County, NY, who have completed their undergraduate studies and are now beginning to embark on their professional careers. Composers must submit a CULTIVATE application form (downloadable), three representative works and recordings, and 1- to 2-page resume. Eight gifted American composers from five states and Great Britain have been selected for coveted, all-expenses-paid residencies during the 2013-14 season at Aaron Copland’s National Historic Landmark home in New York’s lower Hudson Valley. The winners of the 2013 Copland House Residency Awards are Keith Fitch (47, Cleveland Heights,OH), Saad Haddad (20, Northridge, CA), Aaron Holloway-Nahum (30, London, UK), Tonia Ko (24, Ithaca, NY), Nicholas Omiccioli (31, Kansas City, MO), Kurt Rohde (46, San Francisco, CA), Christopher Theofanidis (45, New Haven, CT), and Dale Trumbore (25, Los Angeles, CA). This year’s eminent jury, which included composers Eric Chasalow (himself a former Copland House Resident), Daren Hagen, and Paul Moravec, reviewed the applications of 99 composers from 26 states and 5 countries. This is the start of the 16th round of coveted composer residencies since Copland House, celebrating its 15th Anniversary this season, welcomed its first composer just before Thanksgiving in 1998. Copland House has announced the Fellows for its CULTIVATE 2013 emerging composers’ institute. For full press release, click HERE. For CULTIVATE 2013 video click HERE. Applications are now being accepted for Copland House’s acclaimed new CULTIVATE program (Derek Bermel, Director), an intensive, all-scholarship creative workshop and mentoring program for emerging composers. Six Fellowships will be awarded to American citizens or permanent residents in the earliest stage of their professional careers, to participate in this weeklong emerging composers’ institute, which takes place June 3-10, 2013 at Copland’s National Historic Landmark home and at the nearby historic Merestead estate. All expenses (round-trip transportation within the continental U.S., session participation, accommodations, food) are covered.